The S224 is Giuliano's Superautomatic tyre changer suitable for car and motorcycle wheels having rim size from 12" to 24" rim (max. diameter 1000 mm./39", max. wheel width 380 mm./15"). Equipped with turntable double speed bidirectional rotation system with hand switch control. 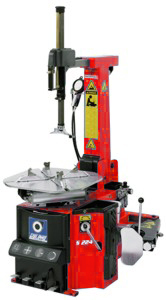 The S224 can be fitted with a range of accessories including the interchangeable mounting head system detailed below.